I’ve setup an end-fed long wire from the corner of my lot that will allow me to use a broad frequency spectrum, but it’s a compromise. I have it on a 25’ pole that I can raise and lower. It’s only up when I’m using it so my neighbors don’t have to look at it all the time. There are some stealth options but it will take some time and work to figure this out... But here’s the thing... I find that I really enjoy getting outside and using my HF skills. Then you need to hike the route, and setup your equipment in a area you’ve never been. The real setup of course is the antenna, for the radio, you just pull it out of the bag and hook stuff up. Most SOTA operators use a low power transceiver, and for me, I started with the Yaesu FT-817ND which has an almost cult status. I also got a cheap 20 meter dipole antenna that I put up on a lightweight fiberglass telescoping pole and hook the ends of the antenna to para-cord and stake it down to create an inverted V shaped antenna. It’s cheap and super effective (read on and you’ll see what I mean). My third attempt to get it right and start my exploration of SOTA was a huge success. One of the three or so contacts I made was in Japan. His name was Haruo, JA1CG, and he couldn’t believe I was using only 5 watts since he was using 1000 watts and a beam on a tower. The conditions were perfect for that contact with the setting sun sitting right between us ionizing the atmosphere which was conducive to excellent skip conditions. According to what I’ve read, salt water is like concrete to radio waves and I could see the ocean from my location. Since he was set of me, everything lined up. This wasn’t a fluke, as I was able to repeat it, but more on that in another post. I used my FT-817 5 watt radio for the first few of months but there were days when the atmospheric conditions were so bad that it was taking me way too long to get my contacts. And one time I gave up since Jeanette was waiting for me and I was frustrated. 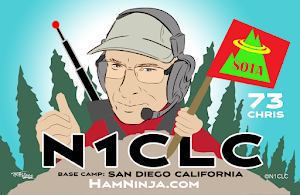 If there was a contest going on (where a lot of hams are trying to get as many contacts as possible), I could rarely compete with other hams responding to call using huge towers, beams, and 1000 watt radios. Being on a mountain top gives me a huge advantage but I needed a bit more punch to get recognized. 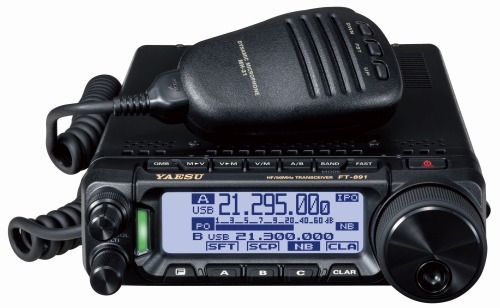 My solution was a 100 watt Yaesu FT-891 portable that I snagged on eBay. It’s designed for install into a car and weighs about 2 lbs more than the 817, is a bit larger, and it has a larger auto-tuner to go with it, but I can now setup, get my contacts and be on my way in about an hour. I prefer not to rush and maybe meditate after, but now, if someone is hiking with me, they don’t have to wait as long. I’m not sure why the guy changed his mind on this radio as it has the latest 32 bit DSP magic from Yaesu and works like a charm. The other improvement I’ve made to my rig is a “Packtenna” system that is similar to my cheap dipole but much easier to work with, allows me to switch to 40 meter if I want, and it converts into a end-fed long wire which allows me to switch around bands without issue. I’m waiting on a vertical unit to come in which will be handy when traveling to very busy summits where I can’t setup a large antenna, plus, setup is 5 minutes. It won’t perform like the dipole but it will be fun to experiment with. This was a bit more than an introduction to SOTA. Stay tuned for more posts where I’ll log each expedition and let you know what I found out, issues, fails, and successes.